Patients undergoing osteoporosis treatment benefit greatly from early detection. 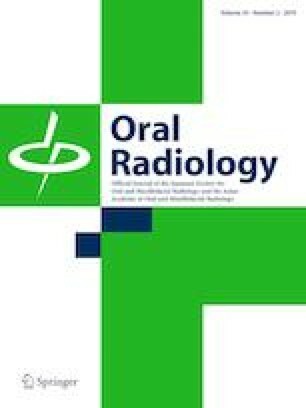 We previously developed a computer-aided diagnosis (CAD) system to identify osteoporosis using panoramic radiographs. However, the region of interest (ROI) was relatively small, and the method to select suitable ROIs was labor-intensive. This study aimed to expand the ROI and perform semi-automatized extraction of ROIs. The diagnostic performance and operating time were also assessed. We used panoramic radiographs and skeletal bone mineral density data of 200 postmenopausal women. Using the reference point that we defined by averaging 100 panoramic images as the lower mandibular border under the mental foramen, a 400 × 100-pixel ROI was automatically extracted and divided into four 100 × 100-pixel blocks. Valid blocks were analyzed using program 1, which examined each block separately, and program 2, which divided the blocks into smaller segments and performed scans/analyses across blocks. Diagnostic performance was evaluated using another set of 100 panoramic images. Most ROIs (97.0%) were correctly extracted. The operation time decreased to 51.4% for program 1 and to 69.3% for program 2. The sensitivity, specificity, and accuracy for identifying osteoporosis were 84.0, 68.0, and 72.0% for program 1 and 92.0, 62.7, and 70.0% for program 2, respectively. Compared with the previous conventional system, program 2 recorded a slightly higher sensitivity, although it occasionally also elicited false positives. Patients at risk for osteoporosis can be identified more rapidly using this new CAD system, which may contribute to earlier detection and intervention and improved medical care. Nakamoto T, Taguchi A, Verdonschot RG, and Kakimoto N declare that they have no conflict of interest. This article does not contain any studies with animal subjects performed by the author. International Osteoporosis Foundation. Report on Japan, Asia-Pacific regional audit. 2013. http://www.iofbonehealth.org/sites/default/files/media/PDFs/Regional%20Audits/2013-Asia_Pacific_Audit-Japan_0_0.pdf. Cited 28 Nov 2017.